Oxy-acetylene welding is one type of welding process used in metal fabrication. 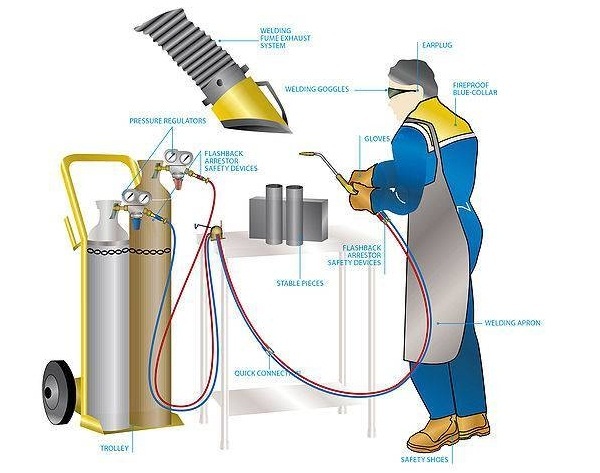 This type of welding uses a torch fed by an oxygen and acetylene fuel mixture to heat the metal parts to be welded as well as the welding filler rod used to add material to the weld. Oxy-acetylene welding has been in use since the turn of the 20th century, and does not require electrical power, allowing the welding equipment to be used in a wide variety of environments. What Operations Can Oxy-Acetylene Equipment Perform? This equipment can be used to flame harden and temper work pieces of varying sizes and for the cutting and welding of metals. What Temperatures does Oxy-Acetylene Equipment Produce? Acetylene gas (C2H2) is explosive at 25psi; therefore, it is stored by dissolving it in acetone. This way it can be pressurized in a cylinder at 200psi. All fittings associated with acetylene have left-handed threads and the hose is red color. The acetylene cylinder is equipped with safety fuses. There are four fuses in total; two on the top and two on the bottom. These fuses will melt at approximately 1210ºF, thereby prevention an explosion. Oxygen is stored in the cylinder at or under 2000psi. This cylinder has a bursting safety disk which releases the pressure in the cylinder; preventing an explosion. All fitting associated with oxygen have right-handed threads and the hose is green or black color. Connecting cylinder valve to a gauge or regulator will reduce the internal cylinder pressure to a working pressure. 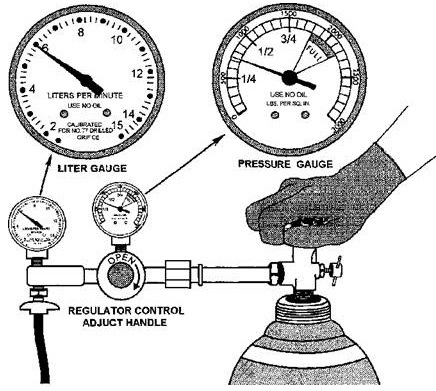 Pressure Gauges: On a regulator one gauge indicates the tank pressure and the second gauge indicates the set working pressure. Notes: Atmospheric air consists of about Oxygen (23% ), Nitrogen (75%) and other gases (2%). Makeup is by volume. How do you think we make a solution of 100% Oxygen? Liquefying atmospheric air by compressing and cooling. Oxygen and Nitrogen have different temperatures where they change states. By electrolysis of water, because Oxygen is negatively charge and Hydrogen in positively charged an electric current will separated all the atoms from each other thus releasing the Oxygen. Injector type – has a trigger and is used for cutting. Equal pressure type – constant flame is used for welding.